Some lawmakers had fretted that sending the preliminary, faulty list to the state’s top prosecutor would intimidate voters. 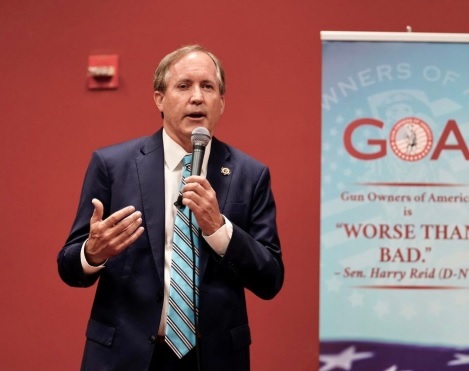 Texas Attorney General Ken Paxton speaks to gun owners at the Republican Party of Texas convention in San Antonio on June 15, 2018. Two weeks ago, Whitley’s office flagged 95,000 Texas voters as potential non-citizens because they had, at some point over the last two decades, identified themselves to state workers as non-citizens while registering for a driver’s license. But in the days since, major flaws have emerged in the data, including the erroneous inclusion of naturalized citizens. Whitley’s review of the data did not account for people who became naturalized citizens — and then legitimately registered to vote — after receiving those documents. Driver’s licenses don’t have to be renewed for several years, and naturalized citizens are not required to update the Department of Public Safety on their citizenship status. At the hearing on Thursday, Democrats, particularly Sen. Kirk Watson of Austin, expressed concern that Whitley had referred the list to Paxton — the state’s chief legal officer — before counties had been given the opportunity to confirm the citizenship of those flagged. Unlike the secretary of state, Paxton’s office has the authority to launch criminal investigations and prosecute voter fraud. Some lawmakers fretted that sending the preliminary, faulty list to a top prosecutor would intimidate voters. Whitley defended referring the list to the attorney general, given his office’s limited authority to investigate. But he also describing the data as “preliminary.” Democrats appeared unconvinced by his explanation, repeatedly noting he could’ve waited until local elections officials vetted the list. It’s unclear when — if ever — local election officials will finish vetting the state’s list. Citing the flawed data provided by the state, some county officials have said they’re holding off on reviewing their lists. In some cases, local officials said they’re concerned they could end up violating the voting rights of naturalized citizens erroneously included on the lists. If counties do evaluate the citizenship of those on their voter rolls — a process that may be held up for months as three separate federal civil rights lawsuit march through the courts — the lists of voters whose registration are questionable are likely to shrink considerably.